This title was first published in 2002: Changing economic, institutional and market environments have turned the spatial inter-relationships thought to exist in China upside-down. 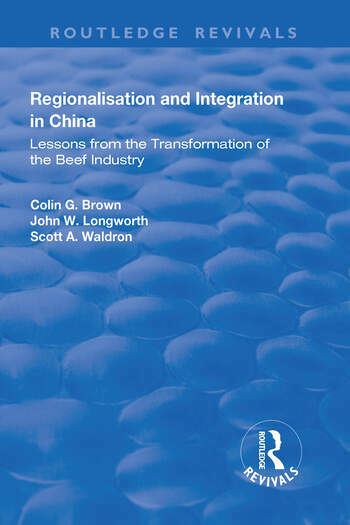 Through an investigation of the beef industry, this text builds a picture of where regionalization and integration are heading in China. It examines the impacts of market forces, industry characteristics, relative factor endowments and government influence on the spatial organization of activities. It reveals the influence of government as priorities are re-assessed and as markets and industries develop, as well as exploring the extent of regional co-ordination and co-operation and how central and local government policies and strategies reconcile. The volume also contains regional assessments of the beef industry in 12 key producing provinces and the key consumption areas of Beijing, Shanghai and Hong Kong.